Utility to decrypt password-protected pkzip/WinZip archives. 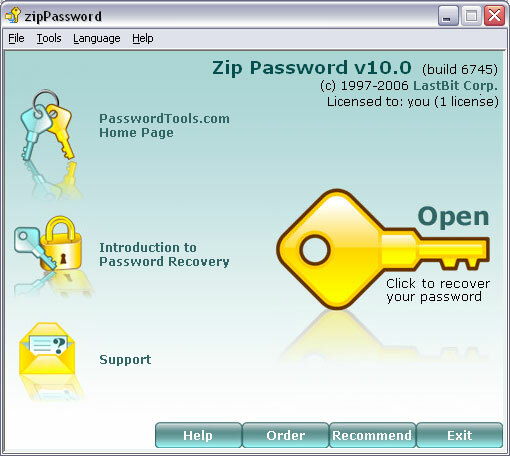 Zip Password supports brute-force, smart-force attack and dictionary search. Zip Password features unprecedented search speed: up to 3,000,000,000 passwords per minute (over 50,000,000 passwords per second). As of now, it's the world fastest password recovery program, up to 3 times faster than the best competitors software. Zip Password supports very fast and effective Known Plain Text Attack. For you, this means that if you have a plain unencrypted copy of any file from the archive, you can recover access to the entire archive within 24 hours regardless of the password length. Zip Password is able to handle archives containing only one encrypted file (some other tools fail on such archives). ZIP files created by various software packages in all compression modes are supported. Self-extracting archives are supported. The program is highly customizable: you can control and tune recovery process. You can interrupt the program at any time and resume the recovery process later.